Simple Green Gutter Clean is a quick and easy way to remove black streaks, environmental soils and pollutants that are not only unsightly, but can also cause damage if left untreated. The ready-to-use formula requires no mixing, heavy scrubbing, special equipment or potentially damaging pressure washing. The versatile formula works on a wide variety of building exteriors made from metal, vinyl, plastic and more. It removes black streaks, mildew stains, pollution build-up, tree sap, soot, bird droppings and other common soils and stains. In addition, it helps keep gutters free of sticky sap and residue that could cause back-up and over flow. The formula is biodegradable and does not contain bleach, acid, lye or phosphates that can cause damage to structures and landscaping. It's also non-flammable, non-corrosive, non-acidic and non-caustic, making it a safer alternative to commonly used cleaning products. The simple spray and wipe application makes cleaning easy. 1 gallon cleans up to 200 square feet. 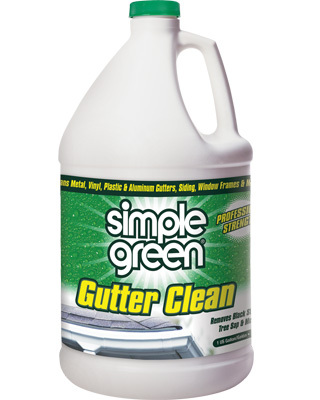 Simple Green Gutter Clean removes dirt, grease, black streaks and mildew stains from gutters, eaves, siding, trim, window and door frames and other building exteriors. For use on metal, vinyl and plastic gutters. Safe for painted or powder-coated metal, bare steel and aluminum.